Serious gardeners are always looking for ways to make their favorite plants and crops better, and give better produce, worth the time and investment. For those that prefer the organic gardening, worm castings are, nutrient-rich, improve soil drainage, and enhance water retention. The worm is the best organic manure that you can get for your plants. You can make your nutrient-rich worm castings at the comfort of your home, easily with the best worm composter, and the following are some of them. 1 Why Use a Worm Composter? If you are looking for an effective vermicomposter, then Hungry Bin Flow-Through Worm Farm is among the ideal. Manufactured at the highest of standards, the worm composter provides the most convenient way of dealing with food scraps, and other organic kitchen waste- finally, some use for those smelly vegetable and fruit remains. The worm farm has an innovative design that makes harvesting an easy task. The tapered design pushes the waste down as the worms work on them, and the gravity pushes them down. It can produce up to 4lbs of worm castings on a daily basis – quite productive. The expandable design from four trays to eight makes this composting bin, one of the most ideal. For easier harvesting, the rid converts to a stand. 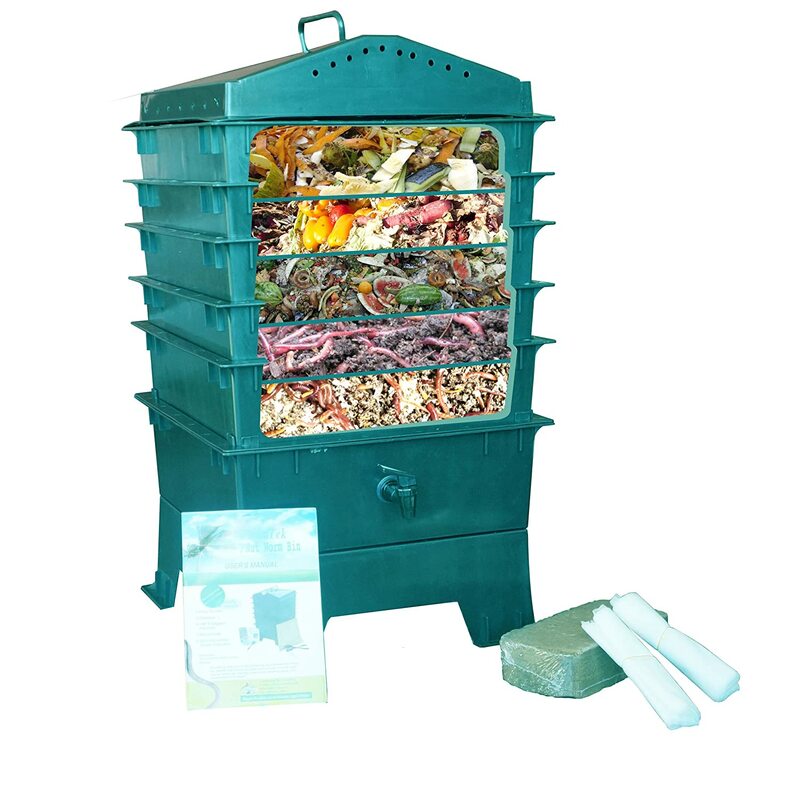 There is an inbuilt worm tea collector, and spigot for easy harvesting – there’s no need to disturb the colony. There’s an instructional manual to make it easier for you to operate it. You will also find an infographic to guide you on the ideal worm diet, and you no longer need to worry about what is good for your worms. 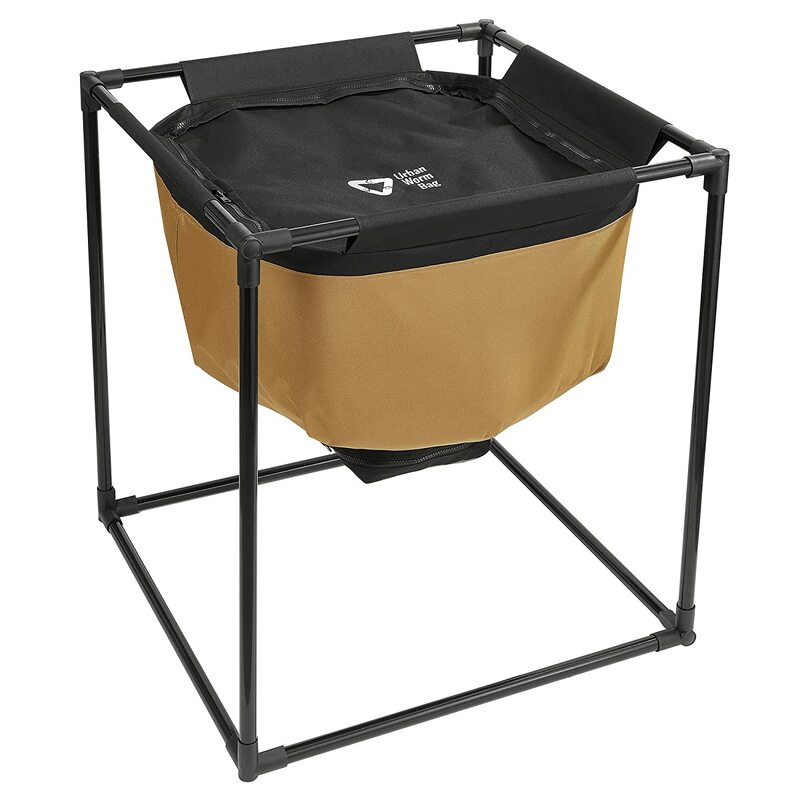 The worm composter has a decent size of five trays, but expandable to seven when necessary. To make it easier to handle, the empty trays weigh 12.5lbs only – obviously among the lightest. It is odor-free meaning that you can use it both indoors, and outdoors. The worm factory also comes with an instructional manual to make it easy for you. The big problem with most worm composters is that they sometimes get too hot during scorching weather. They, therefore, die from too much heat. However, Urban Worm Bag Worm Composting Bin is breathable and allows heat to dissipate quickly – but that doesn’t mean you should keep it under direct sunlight. Its design and bottom zipper button are easy to use. The castings exit the composter in a controlled manner. The stackable trays design makes feeding the worms and harvesting, an easy task. That means you can easily separate the worms and castings during the harvest. 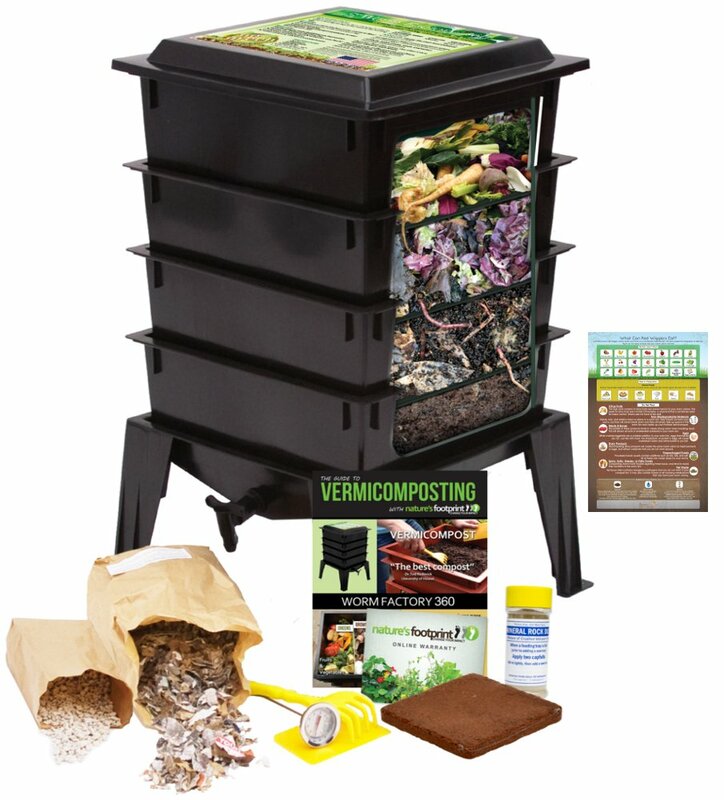 While most other composters may have problems with air circulation, VermiHut 5-Tray Worm Compost Bin does not – it is quite effective. Since the composter is odorless, you can use it inside – there is no need to hassle a lot, searching for an ideal outdoor environment. Why Use a Worm Composter? Worm castings are not only right for your plants, but the organic manure has all the nutrients that your plants need. The worm castings are safe, and you can apply them directly to the plant roots, without the risk of burning. That means you can throw a generous pile on the roots of your tomatoes without worrying about anything – they can be a top dressing, a side dressing or even some mulch, your choice. The main benefit associated with worm castings is the quality of the end product that the worms produce. Worms ingest the surrounding organic materials, and in the process end up refining them. The process refines the trace elements, as well as, the nutrients, reducing them to their most usable form, and having a neutral PH. Vermiculture or vermicomposting process produce digested soil full of the good microbes, which help the plants keep diseases at bay, and thrive. As a soil amendment, the worm product does not have any odor and are gentle on the plants. The castings have more nitrogen than your typical garden soil, making them ideal for those kales you have been planning to start planting for some time now. It also makes the soil more absorbent, so that it can hold more moisture to the benefit of the plants. The vermicomposting process introduces the good little guys in the soil. The good bacteria and other microbes make the soil sufficiently healthy for the plants. They also contain humic acid, which plays an important role in plant nutrient absorption. Research shows that planting seedlings in worm castings improves germination, as well as, seedling growth. In other words, worm castings are an ideal food for the plants. Another interesting research indicates that our little wriggly friends help remove toxins and heavy metals from the soil. It means that worms can assist in the land reclamation of contaminated sites. It also means that the process can help keep the garden soil at the best level for the plants. Vermicomposting is not a complicated exercise if you have the necessary information on how to go about it. Typically, you use a worm box or bin, made or purchased. If you prefer to make your own worm composter, ensure it has dimensions of 8 by 12 inches in depth – deal. The box should also have drainage holes at the downside. Making the composter too deep leads to awful smells. Small is better if you want something under your sink or something like that. You should also place a layer of newspaper strips and sand at the bottom. Follow this with another layer of leaf litter, soil and moist newspaper strips. Introduce the worms with garden waste and kitchen scrap for the process to begin. There are a few things that you may need to look out for when selecting vermicomposter for your garden, and the following are some of them. An ideal worm composter has decent drainage with a spigot to take the worm tea out. The worms can drown if there is too much of the liquid from food wastes such as watermelons and cabbages – leachate. The drained leachate is nutrient-rich, but since it has not gone through the worm’s guts, it may, therefore, contain harmful pathogens, and not ideal for the edibles. Use the leachate on flowers and lawn. The amount of organic waste varies depending on the size of family and amount of food consumed. 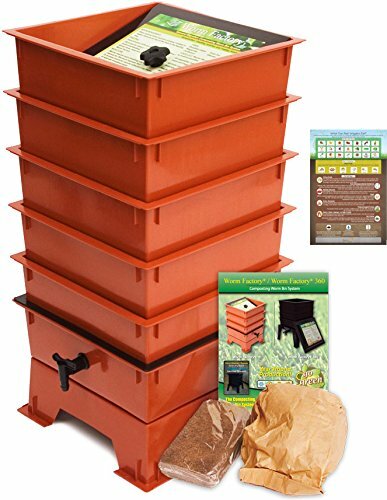 If your family is gradually expanding, you will need a bigger worm composter with sufficient space for the worms. You will eventually need to retrieve the compost, and that requires you to remove the worms first together with their food. The process can be messy, but with a decent composter, you can achieve easy retrieval and fewer disturbances for the colony. Worms don’t like too much sunlight, and so an opaque composter that blocks light is the best. Avoid those that easily allow light inside them. The worms also need to breath; make sure the composter has sufficient ventilation to let fresh air in. The best worm composter is a darling for gardeners. It converts the kitchen waste into something useful for the plants. 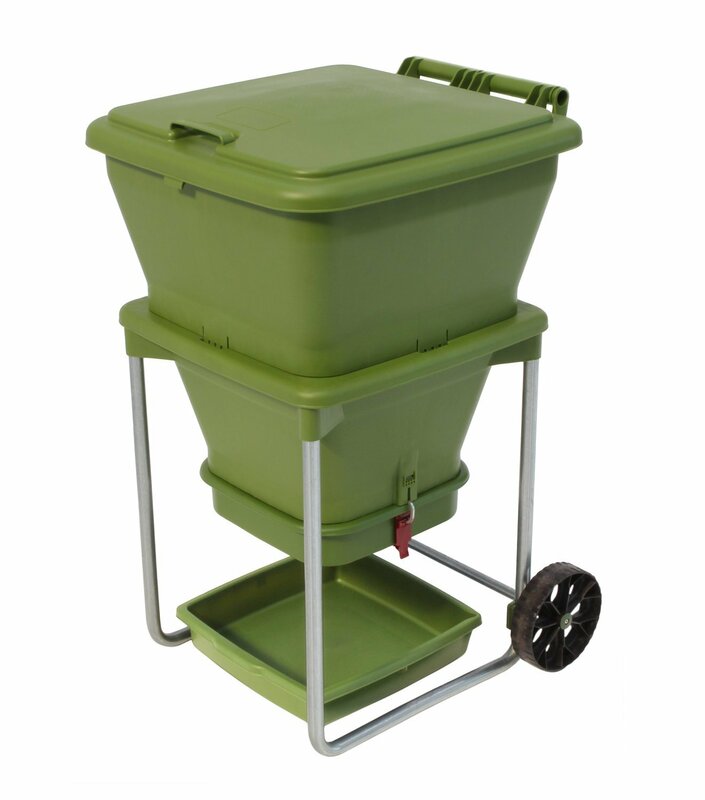 Any of the above can make decent composters, but Hungry Bin Flow-Through Worm Farm is in our opinion the ideal. It has an innovative design that makes usage, an easy task. The worm factory can produce up to 4lbs of worm cast on a daily basis, and it is low maintenance.